Andrew Lubash already knew he wanted a career helping others, but he didn’t expect to get so much help himself along the way. Lubash added to an already stellar academic career Monday when, in a surprise announcement, he learned he had become only the eighth University of Oregon student to win a prestigious Truman Scholarship. The $30,000 award will help Lubash attend graduate school and launch a career in public service. A junior from Beaverton, Ore., with a double major in economics and political science, Lubash was one of 204 finalists for the highly competitive scholarship. 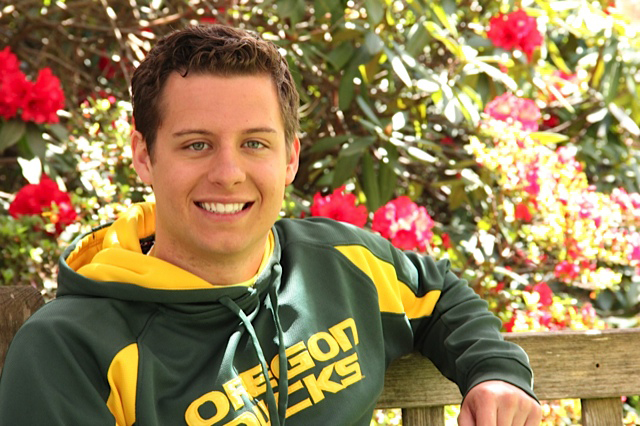 He was among the Truman Scholars Class of 2014 officially announced Wednesday and the first from the UO since 1992. Already a UO Presidential Scholar and a member of the inaugural class of Wayne Morse Scholars, Lubash hopes to pursue a career as a policy advocate or possibly a government relations lawyer for an organization such as the American Civil Liberties Union or Lambda Legal. He is considering applying for a joint degree program in law and public policy at Georgetown University in Washington, D.C. The Truman Scholarship program is a memorial to the late president Harry S. Truman. Its purpose is to develop new generations of public service leaders and “change agents” who will help shape public policy in the future. That’s a description that fits Lubash to a T. His 3.89 GPA as a Clark Honors College student is coupled with a long list of community service accomplishments. He was the freshman class representative to the Student Senate, is running for another senate seat this year, worked for Oregon state Sen. Mark Hass and is a member of the Oregon Student Association, among other activities. “Andrew is an outstanding student and he’s exceptional in his commitment to community service and activism, so he’s an excellent person for this award,” said Dan Tichenor, Philip H. Knight Professor of Social Science and senior faculty fellow at the Wayne Morse Center for Law and Politics. An openly gay man, Lubash’s passion is working on issues involving the rights and treatment of lesbian, gay, bisexual and transgender students. He advised Hass on those issues in the Oregon Legislature and successfully advocated for gender-neutral bathrooms in the remodel of the Erb Memorial Union, a project now under way. Lubash said he decided early on he wanted to make a difference in life, after hearing friends talking about how people seem to have a choice about spending their lives looking for a good time or living a life that that has meaning. “I’ve always wanted to fall into the second category,” he said. Lubash has a particular interest in the recognition and prevention of bullying, focusing on LGBT students in K-12 schools. He wrote a policy paper on the subject as part of his Truman Scholarship application package and hopes to make it a focus of his graduate program as well. He said he hopes to work on ways schools can be more effective in detecting and responding to bullying of all sorts. And although his goals are high, he said he brings a pragmatic approach to problem-solving and accepts that sometimes progress is made in small steps rather than large ones. Lubash’s application for the Truman Scholarship was supported by his faculty advisor, Bruce Blonigen, Philip H. Knight Professor of Social Science and acting associate dean for social science, as part of the UO’s distinguished scholars program. Faculty leaders involved in the program recruit, advise and support students in efforts to garner nationally and internationally competitive scholarships and fellowships. Blonigen, the Truman Scholarship faculty representative at the UO, said he was impressed with Lubash from the first day he met him. Blonigen was one of several university professors and administrators, including UO President Michael Gottfredson, who surprised Lubash with the scholarship announcement during his econometrics class earlier this week. Lubash said it took him a few moments to process what was happening when Blonigen called him to the front of the room to congratulate him and a few more before he could stop shaking.